Tenaya Amelia is a life-long dreamer trained by renowned dream teacher Robert Moss, creator of Active Dreaming. She has completed Robert Moss' three-year Dream Teacher Training Program. Intuitive, sensitive and creative, she holds a safe and vibrant space to explore the inner realms. Tenaya weaves together intuitive painting, collage, expressive movement and evocative music into her unique offerings. 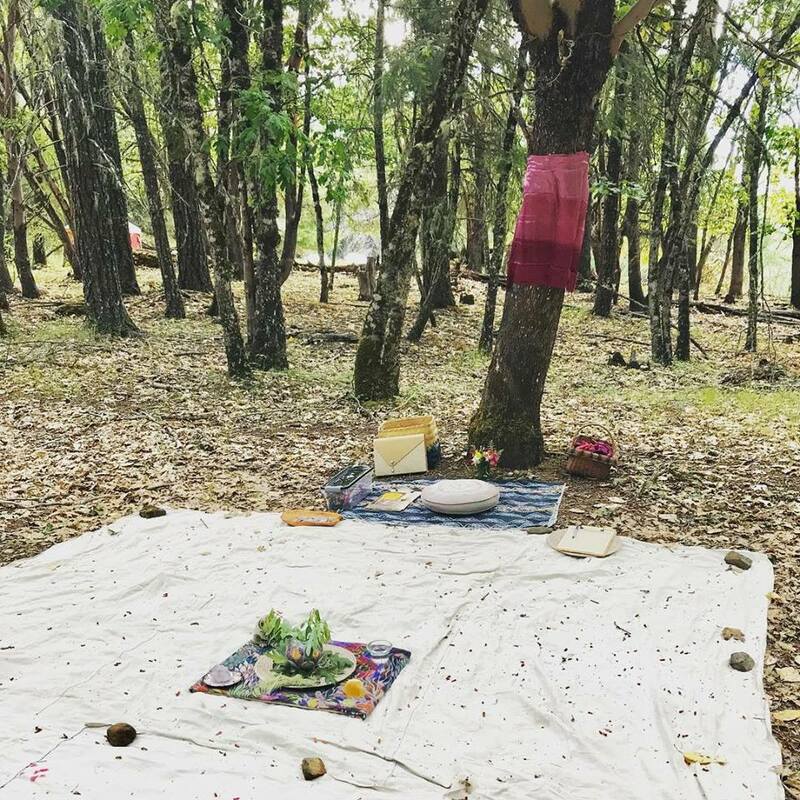 She is based in Northern California and offers workshops, Dream Exploration Sessions and a Monthly Dream Salon. Tenaya loves to paint from her dreams, and also designs Visionary websites. She was recently invited to bring Active Dreaming to Spirit Weavers Gathering in Oregon. In 2018, Tenaya’s painting, The Amber Road, was published on the cover of Robert Moss’ new book, Mysterious Realities: A Dream Traveler’s Tales from the Imaginal Realm, and she had a solo painting exhibition, Energy Made Visible, at Heart Tribe in Fairfax, CA. In 2018, Tenaya was invited to be a guest contributor for Nikki Cade’s online painting e-course, Worlds of Wonder, where she shared an Active Dreaming activity to inspire creativity. She has also appeared on The Way of the Dreamer radio show with Robert Moss. As a little girl sharing dreams with my mom around the breakfast table, I loved telling her about my adventures flying high above the ocean, exploring a house made of sky, and discovering a fantastical underwater world after being swallowed by a tidal wave! My mother nurtured my early interest in dreams, and wrote them down for me in a journal. My parents named me Tenaya, which means "one who dreams" or "dreamer of wisdom" in the Ahwahnechee language of the people who lived in the valley of Yosemite. My name has always felt like my calling. As a child, my mom had lots of art supplies around, and I loved painting at my easel, or on the side of the house (with water!) She encouraged me to find beauty in the everyday, and taught me to create by example~ She was a weaver, painter & cut paper artist. In high school I immersed myself in the study of shamanism, inspired by Michael Harner's seminal book, The Way of the Shaman, as well as other world wisdom, magic and folk healing traditions. 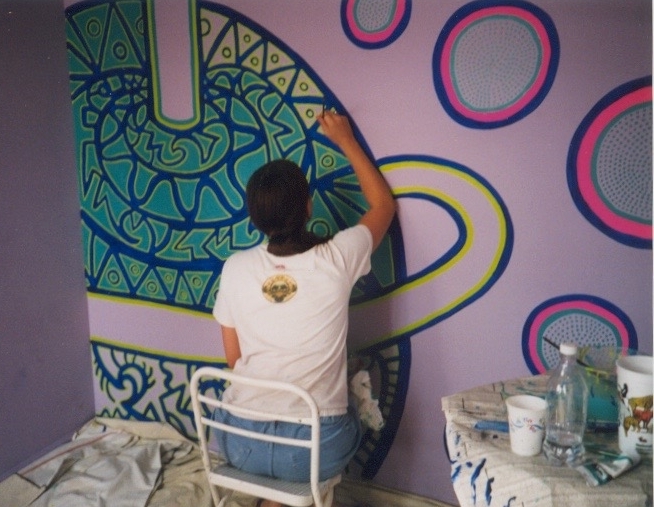 I also began painting large scale works in acrylic, as well as murals. Inspired by surrealism, tribal and visionary art, I explored bold colors, graphic, stylized line work and lots of dots! ...The purple phase... Please note the holographic lunchbox purse! At the California College of the Arts I dove into various studio art disciplines~ glassblowing, weaving and dyeing, metal work, Raku pottery...And a class called Dreams and Daydreams Papermaking Techniques. In this class I collaborated with a photographer friend to create a visionary, dream-journey-inspired slide show with music. We shot it in a cemetery in Oakland using long and multiple exposures to evoke a ghost-like feel. During my time at CCA I discovered the underground trance music scene in San Francisco and had the opportunity to create altars at various all-night parties. In 2000 I moved to the Big Island of Hawaii and lived deep in the middle of the jungle at a yoga retreat center, where I danced all night on the beach at full moon parties, painted a large mural on a storefront in Pahoa, and soaked in the spiritual and vital energy of life on the island. Living close to the land, off the grid, swimming daily on a majestic black sand beach, floating in mysterious Green Lake, and eating avocados, starfruit, and bananas right off the tree all influenced my creative path~ A time of trust, exploration, manifestation and discovery. In 2006 I completed my degree at the California Institute of Integral Studies (CIIS) where I focused my independent study on contemporary dreamwork and expressive arts. During this time, with the support of a therapist, I used my dreams to explore and process trauma and move through depression. Art and dreamwork was a safe place that held me as I grappled with my father's diagnosis with early-onset Dementia. Dreaming Self collage with dream journal entries~ 3x5 ft.
From 2010-2015 I ran a successful greeting card company, Dream Speak Design, featuring my original images created using cut paper, metallic gold ink and gouache. When I attended my first workshop with Robert Moss, I knew I had found my true calling~ A way to bring together my interests in dreamwork, shamanism, expressive arts, and world wisdom traditions. Robert invited me to train with him at his School of Active Dreaming, a three-year Dream Teacher training program, and in 2016 I began teaching classes and workshops, as well as offering Dream Exploration Sessions in Fairfax, CA, and over the phone/Skype with distance clients. I've studied with Robert extensively in Washington State at Mosswood Hollow, at Esalen in Big Sur, and at a gathering for advanced practitioners at Gore Mountain in the Adirondack Mountains in upstate New York. Twice in 2016 I had the good fortune to travel to Flora Bowley's magical painting studio in Portland, Oregon and attend her Bloom True workshops. She introduced me to a unique process she developed of layered painting with fluid acrylics. After working on a small scale for years of making greeting cards (8"x8"), it was exhilarating to dive into large scale work again (36”x36”)! Flora is a generous and inspiring teacher and I'm so grateful she encouraged me to paint big and bold and free. On a personal level, her warm, grounded, and open style of teaching is a shining example of what I strive to offer my students. In June of 2018 I was invited to teach two Active Dreaming classes at Spirit Weavers Gathering in Cave Junction, Oregon. Nestled in the forest I offered: The Art of Kairomancy: Guiding Life by Synchronicity and Dreams & Dreaming with the Ancestors. In October 2018 my painting, The Amber Road, will be featured on the cover of Robert Moss’ new book, Mysterious Realities: A Dream Traveler's Tales from the Imaginal Realm, which is available on Amazon. In September of 2018 I had a solo show of my art at Heart Tribe in Fairfax, CA, Energy Made Visible: Intuitive Dream Painting. Blue Heron Holds the Dreaming depicts the realm of dreams, intuition, and the invisible dimension that interpenetrates the physical, everyday world of form. This painting is a window into another realm of magic and dreaming, where Ancestors, Spirits & Guides dance, beckoning us to explore the world behind the world. Blue Heron spirit holds the raw potential power that dreams birth through us.